I decided I really wanted to challenge myself, so I’m jumping into Iron Cupcake, in part because I was so excited about the theme! 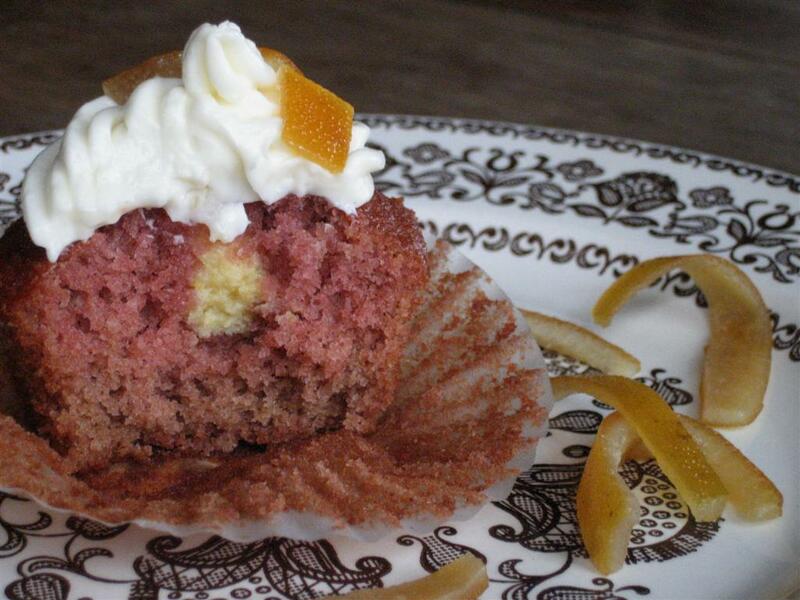 I’ve always loved a particular cranberry orange relish that my grandma always makes for Thanksgiving, so I knew I had to make a tangy, orange-spiked cupcake. The results were super cute…but I wasn’t about to try them until they were finished! Just a comparison...what a difference! 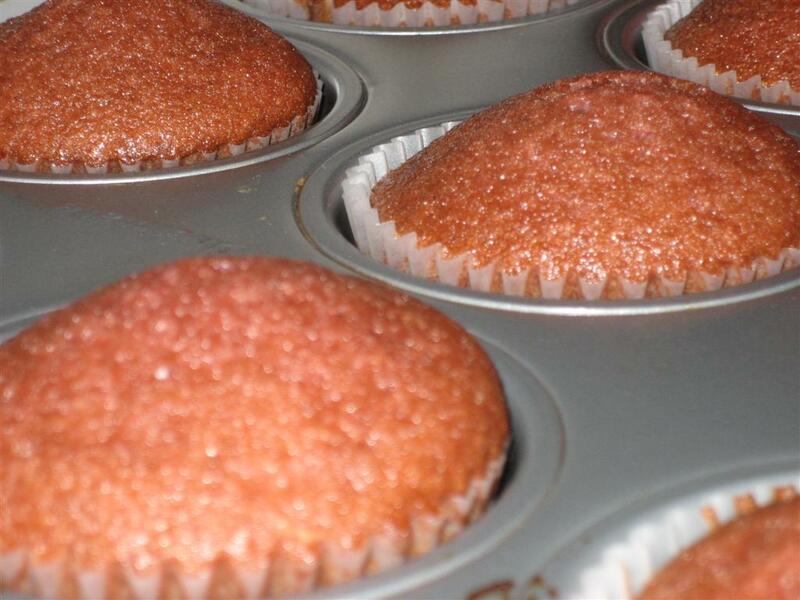 The thing about these cupcakes is…I didn’t really write down the recipe (or measure the ingredients as I was adjusting them…it was more of a “until it looks good” thing), and was just kind of making it up as I went along. But I’m going to do my best to write down what I did! These cupcakes will take a while to put together…I would recommend making the peels, curd and cupcakes the night before, and making the frosting and assembling everything in the morning. Slice the ends off the oranges, score them vertically and carefully peel the cut sections. Remove any overly excessive pith, then slice the peels into thin strips. Place the strips into boiling water and blanch for 3-5 minutes, stirring occasionally. Rinse thoroughly with cold water, then repeat. Put 1 cup water and the sugar into a small saucepan and bring it to a simmer. Add the peels and simmer, covered, for 1 hour, stirring every 5-10 minutes. 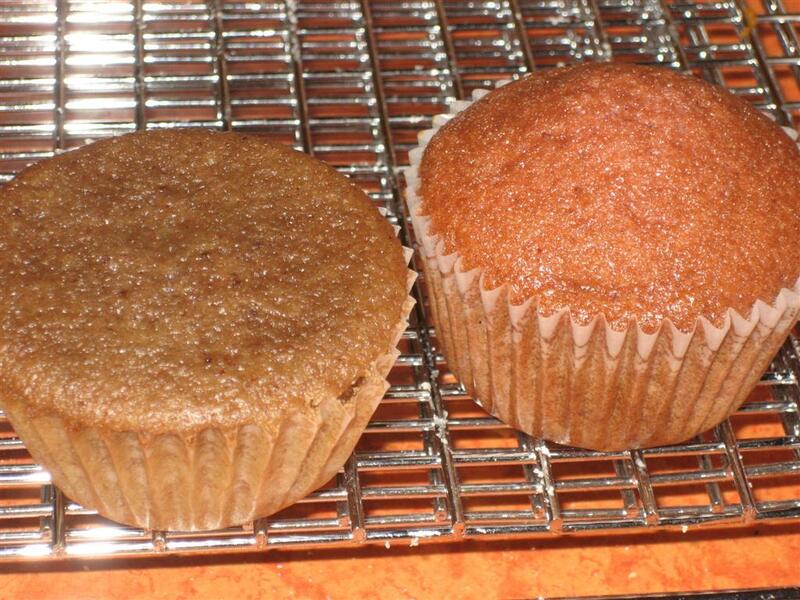 Drain and toss to coat with the extra sugar, then allow to cool and drain on a wire rack. Once dry, store in an airtight container. Cream together the butter and sugars, then add the eggs and cranberry sauce. Mix well, preferably in a Kitchenaid mixer or with a handheld electric beater, as it’s hard to thoroughly break up the jelly sauce by hand. Mix in the juice and dye, add the dry ingredients, then mix well. The batter should be drippy but not runny, and should be a cranberry-mauve color. 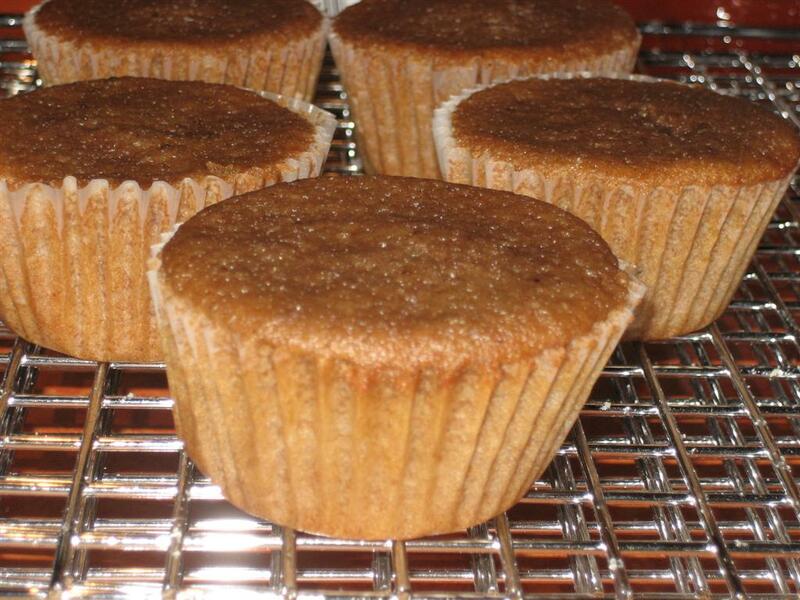 Preheat the oven to 350, scoop the batter into cupcake pans, filling 2/3 to 3/4 full, then bake for 20-25 minutes, or until a fork inserted in the top of a cupcake comes out clean (don’t let them get too brown!). Allow to cool thoroughly (overnight is how I often do it). Beat the cream cheese, butter and vanilla in a large bowl until they are light and fluffy. Gradually beat in the powdered sugar. Spoon the curd into a pastry bag fitted with an injector tip, a few tablespoons at a time. Poke the injector deeply into each cupcake and squeeze the curd in slowly but firmly, until the top of the cakes rise just a little bit. Clean the pastry bag and fit it with a large star tip, spoon the frosting in by half cups. then swirl it onto the cupcakes. 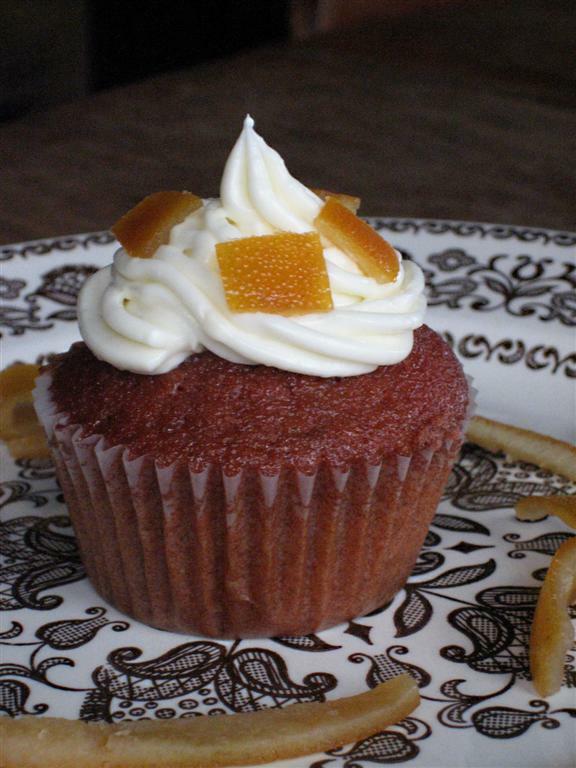 Use a sharp knife to chop the candied orange peel into little bits and arrange on top of frosting. Keep chilled. Ideally, if i could have found it, I would have used a bit of cranberry extract instead of the cranberry juice, and used a little less flour to balance out the loss of liquids. The cranberry flavor is understated, but the tang is absolutely there. The filling is light but strongly flavored, the cake is soft and spicy, and the frosting is sweet, cheesy and absolutely tangy. The candied oranges add an extra little chewiness and – you guessed it – tang! I would absolutely make these again, with good reason of course! For a party or something…at least I got to bring some to someone who was having a birthday. If you want me to win some fantabulous cupcake-related prizes, you should go to No One Puts Cupcake in a Corner to vote for me! LOTS OF SPRINKLES at http://www.etsy.com/shop.php?user_id=6057281 (cupcake earrings!). An apron from SWEET CUPPIN CAKES BAKERY AND CUPCAKERY SUPPLY, http://www.acupcakery.com/cupcake-pocket-birthday-apron.html.